Cheap Trick and Audi - not exactly my first guess as a likely duo. Audi's Super Bowl XLIV ad will feature the Audi A3 TDI in a "fun, tongue-in-cheek environmental theme" with Cheap Trick reinterpreting one of their classic songs as the commercials soundtrack. Now the only question is what song have they remastered for Audi? HERNDON, Va., Jan 8, 2010 - Audi of America today announced that it will advertise during Super Bowl XLIV, the brand’s third consecutive time in the Super Bowl. The spot will highlight the Audi A3 TDI, recently named by Green Car Journal as the 2010 “Green Car of the Year” and will have a fun, tongue-in-cheek environmental theme. Rock legends Cheap Trick will reinterpret one of their classic pieces as the soundtrack to the commercial. Returning to the Super Bowl after a nearly 20-year hiatus, the 2008 Audi spot delivered a parody of the movie “The Godfather” and signaled that the brand was ready to challenge the perceived luxury leaders. The 2009 effort featured actor Jason Statham in a series of high-speed chase scenes involving recent luxury models, sending the dual message that some things are best left in the past and luxury is evolving, with Audi at the forefront. This year, Audi will demonstrate its leadership position within the luxury segment with a brand spot that delivers the message that being environmentally conscious might not be easy, but the Audi A3 TDI clean diesel is now a proven environmental solution. Audi TDI clean diesel technology has achieved amazing sales success and consumer acceptance in the United States in a very short period of time. 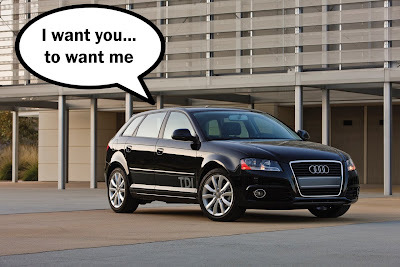 Since their introductions in 2009, the Audi Q7 TDI accounts for 43% of the sales for that line, while the A3 TDI accounts for 53% of that line’s sales. TDI clean diesel technology produces 20% fewer C02 emissions than comparably sized gasoline engines and uses substantially less fuel. In fact, the Q7 TDI has been EPA rated at 25 MPG highway, while using 30% less fuel than a similarly sized gasoline engine. The A3 TDI achieves 42 MPG on the highway. Green Car Journal’s award of “Green Car of the Year” to the A3 TDI is a true validation of the quality and environmentally sound elements of this technology. The A3 TDI is one of the many new models Audi has introduced in the last few years. Joining the stunning R8 sports car, the A5, the A4, the Audi Q5 crossover and the Audi Q7 TDI, among others, the A3 TDI is another terrific vehicle that combines incredible fuel economy with the Audi brand’s commitment to stunning interiors, tremendous performance and excellence in overall engineering. Audi now has one of the industry’s most complete and compelling model line-ups. The advertising agency for Audi, San Francisco-based Venables Bell & Partners created the ad.